200344A Comet Shoe driver assembly, solid zinc weights. Sold as 1 factory sealed package. Replacement for Comet 20/30 Series and TAV Units including Kenbar 300-006, Comet 200344. Home > Comet Clutches and Parts > Comet 219573A (20 Series) Fixed Face and Post (Engine Side Sheave) > Comet 219572A. Movable Face with Splined Hub. > 200344A (Single-Pack) Shoe Driver Assembly. Replaces OEM Shoe Driver Assembly for 20, 30 & Torq-A-Verter belt drive Go Kart Clutches. 200344A Replacement Shoe Driver Assembly. Sold as 1 factory sealed package. Replaces those OEM bushing on Comet 20 Series, 30 Series, and TAV Go Karts. 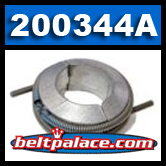 Also Replaces Kenbar 300-006, 200344. Comet Industries part 200344A replaces worn out or broken Shoe Driver Assembly on Comet 20 Series, 30 Series, and TAV/TAV2, Comet TC88, and Comet CAT99 Go Karts Centrifugal Clutch systems including Kenbar 300-006, Comet 200344 parts. This fully assembled Shoe Driver, with zinc weights and blue garter springs. 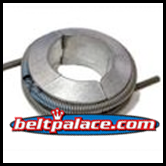 Commonly used as replacement part for Comet clutches in Go Carts, Golf Carts, and Mini-Bikes. Made by Comet Industries. Replaces original Comet 200344-A part. Factory Sealed Genuine Comet Part. Made in USA! COMET 219559-A for Comet 20 Series Drive Clutch. 3/4" (.75 inch) bore. Used on Comet 20 Series, Manco and Carter Go Karts. Replacement drive clutch for 20 Series Comet Go Kart. This Drive Clutch replaces original Comet 219559 Clutch and obsolete 203812A, Manco 2792 (MAN 2792), 203812, 203812A, 219559.